1. 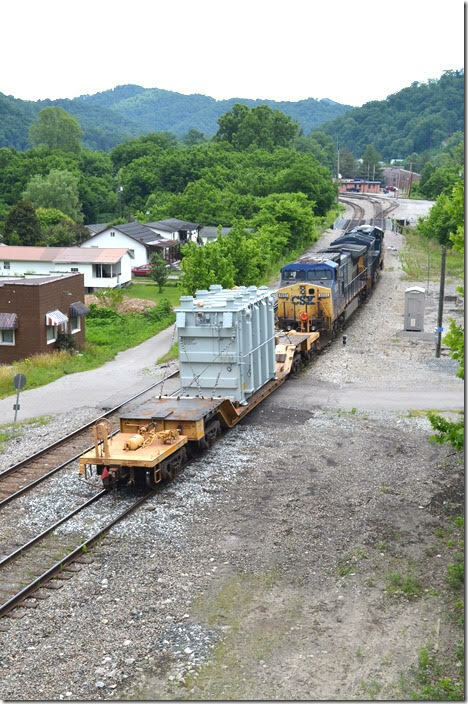 CSX 3284-9002 handled this “high & wide” load W799-08 e/b by FO Cabin on 06-09-2018. This is the reclaimed site of the Chaparral Coal Co. prep. plant in earlier times. 2. W799-08 arrives Shelby on the switching lead. 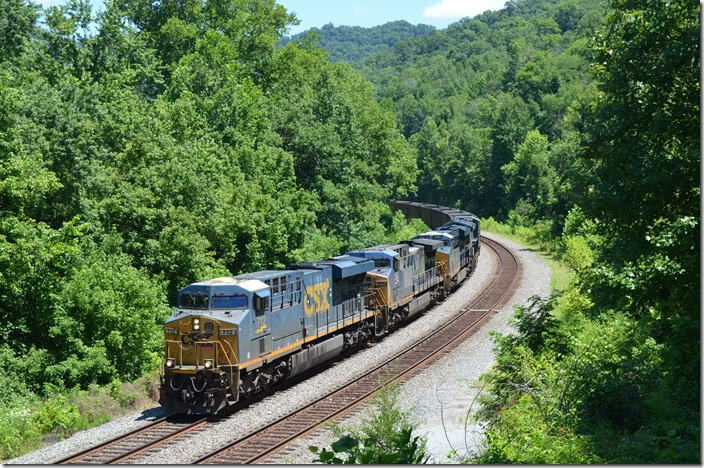 CSX 3284-9002. Shelby KY.
3. 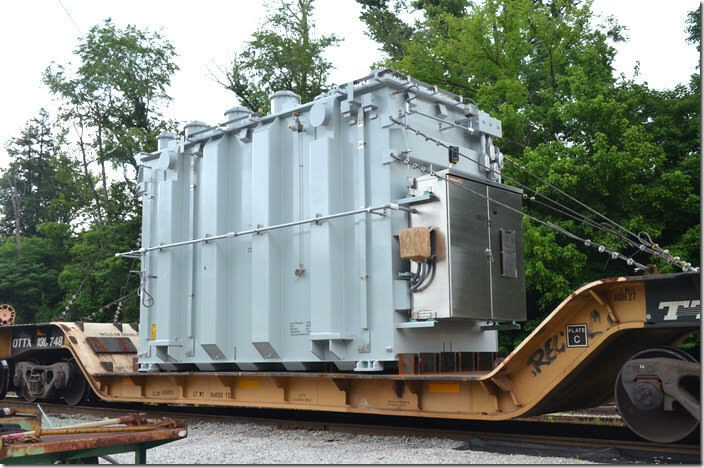 W799-08 spots the transformer on the ready track for unloading. No problem here as engines are rarely put here anymore. QTTX flat 130748. Shelby KY.
4. 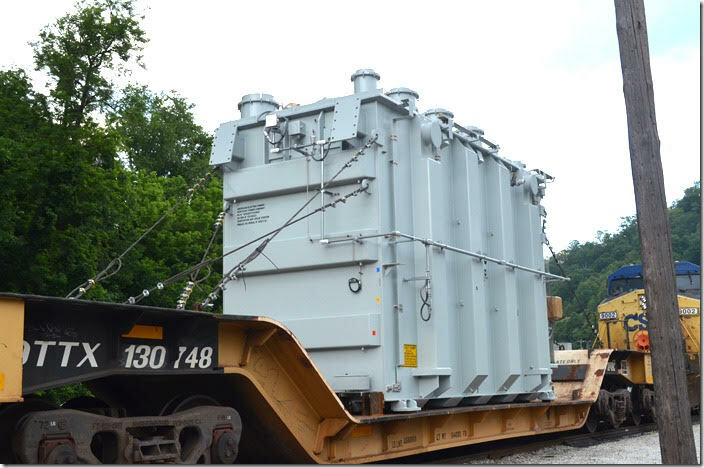 Turns out that lettering on the end says this transformer is destined for Kentucky Power’s Leslie Substation in our Hazard District. I found out later that it was to be stored temporarily on one of our lots at Pikeville KY. QTTX is a reporting mark of TTX Co. QTTX flat 130748. View 2. Shelby KY.
5. QTTX flat 130748. View 3. Shelby KY.
6. 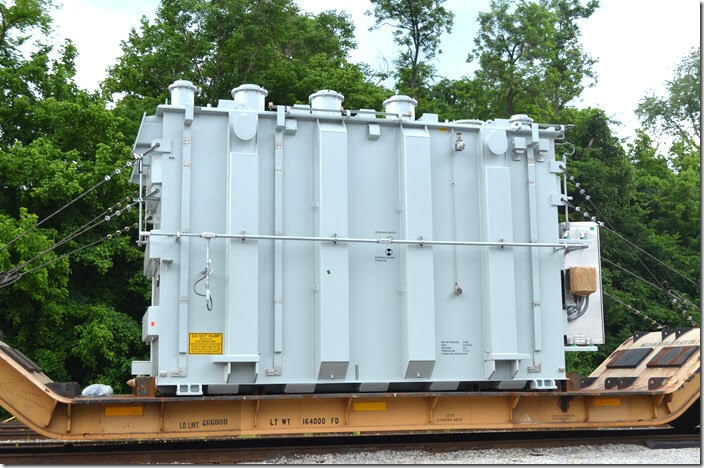 This substation transformer was manufactured by Prolec-GE, presumably in Mexico. It was parked here for a few days before being unloaded. QTTX flat 130748. View 4. Shelby KY.
7. 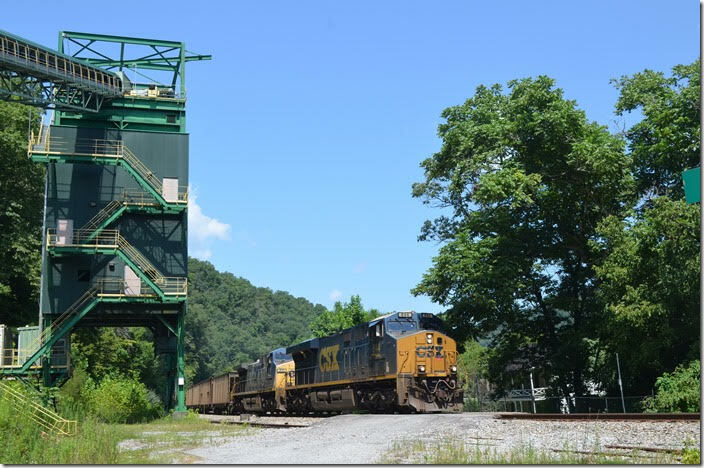 CSX 901 is in the process of loading a train at McCoy-Elkhorn’s Bevins Branch mine on the Coal Run SD near Meta KY on 06-20-2018. 8. 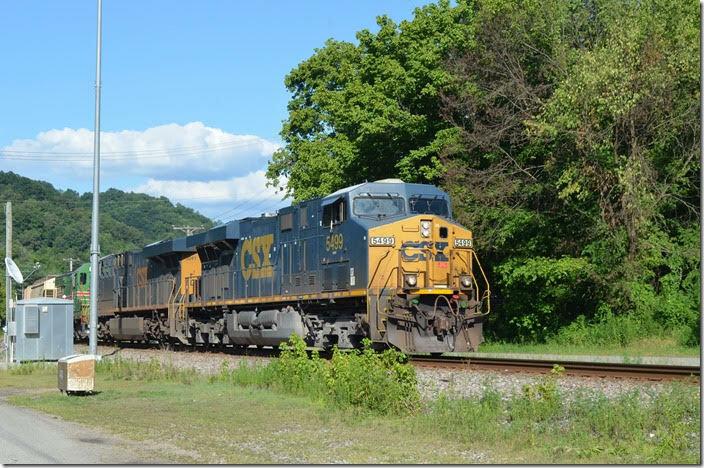 CSX 901. View 2. 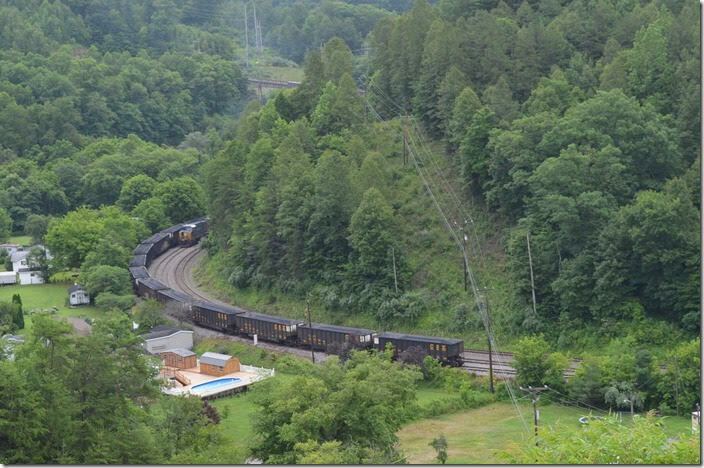 Bevins Branch Mine KY.
9. A track inspector rolls by on the main heading up the creek. CSX 901. View 3. Bevins Branch Mine KY.
10. This was shot from the end of the big US 119 bridge. 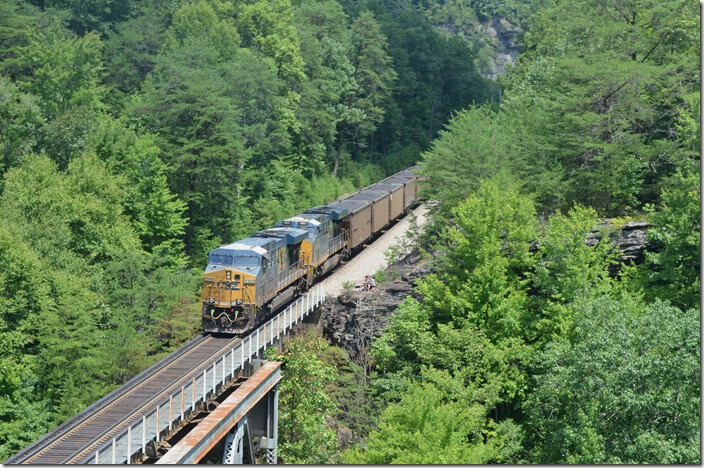 CSX 901. View 4. 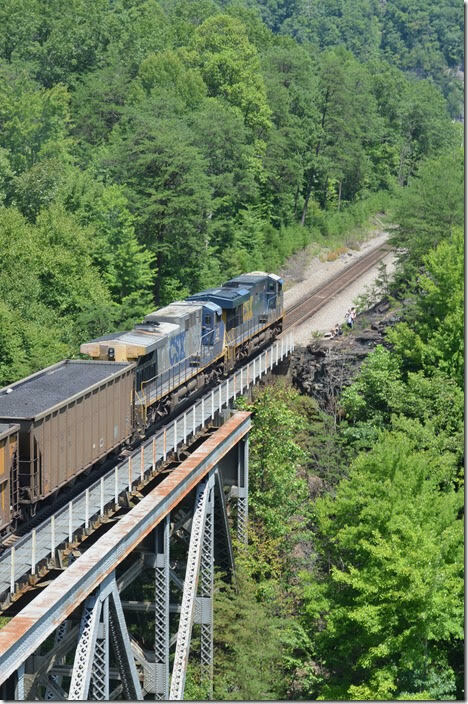 Bevins Branch Mine KY.
11. CSX medium clear signal at FO Cabin for a westbound on the No. 1 main to single track. 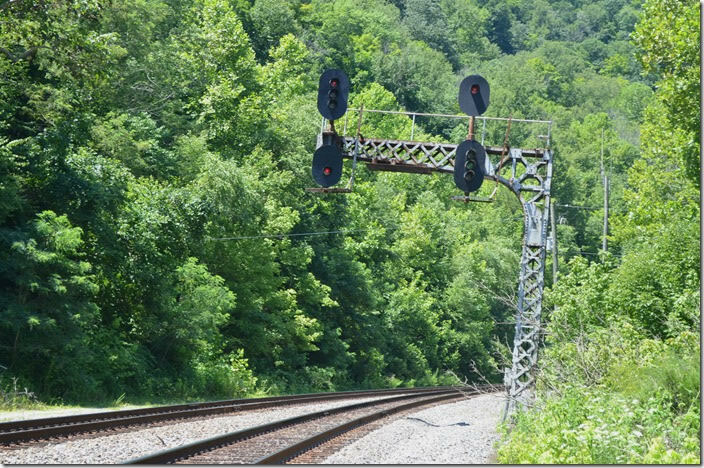 If you think the cantilever signal is leaning slightly it is. A big derailment here in the late 1960s hit it. 12. 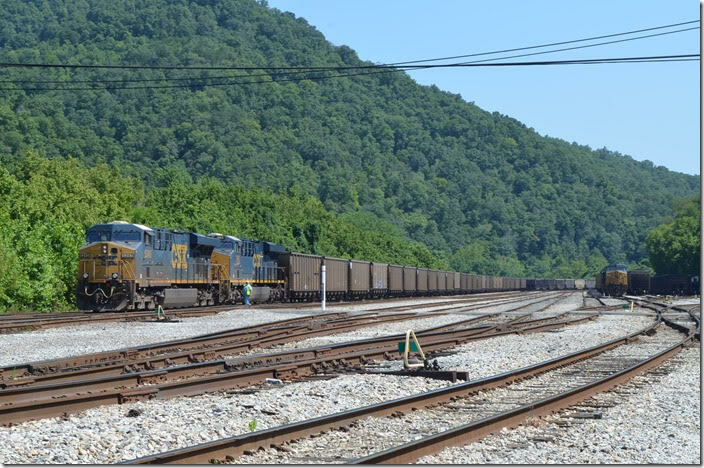 CSX 712-266-3190-3449 have w/b empty DKPX (Duke Energy) hopper train E760-06 on their way to Russell. 07-08-2018. FO Cabin KY.
13. 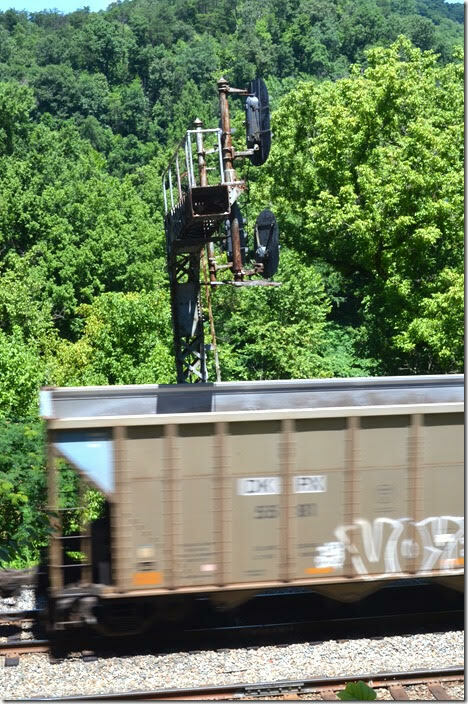 CSX signal. View 2. FO Cabin KY.
14. 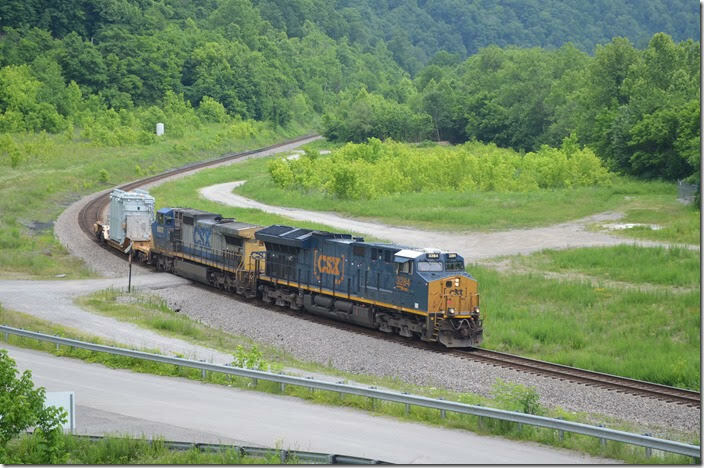 CSX 5499-3041-KLWX 81 have 29 cars of w/b manifest Q692 at Betsy Layne KY on 07-18-2018. 15. 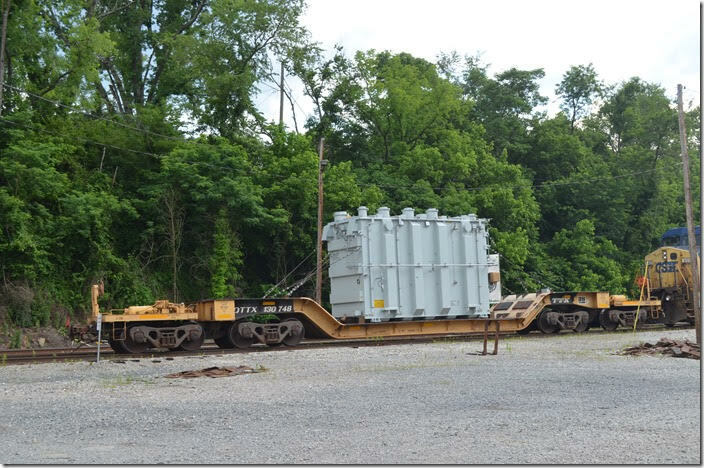 KLWX 81 is now owned by Knoxville Locomotive Works. Originally it was a Southern Ry. SD24. Illinois Central Gulf acquired it, and rebuilt it to a “SD20” in 1980. 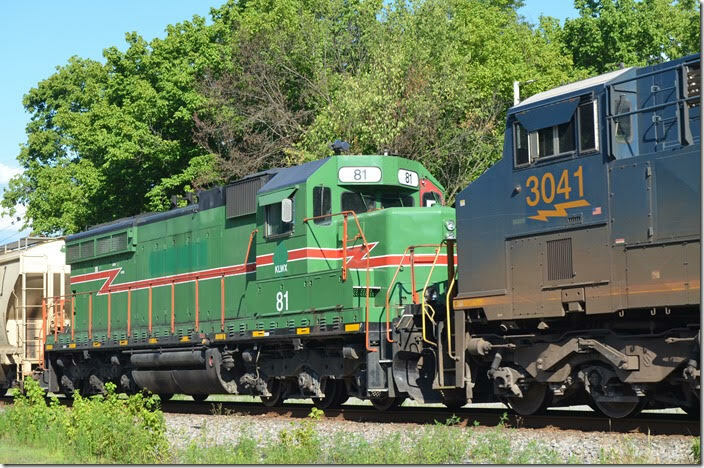 From there it went to the Chicago & Illinois Midland which was acquired by the Genesee & Wyoming Inc. and renamed Illinois & Midland RR. View 2. Betsy Layne KY.
16. Q692 rolls under the Town Branch bridge at Prestonsburg KY. 07-18-2018. CSX 5499-3041-KLWX 81. 17. A “SD20” from the top. ICG rated them at 2,000 HP. KLWX 81. Prestonsburg KY.
18. The crew checks DPU units CSX 5345-993 on the rear of s/b N312-03 before departing Shelby on Sunday, 08-05-2018. Shelby KY.
19. 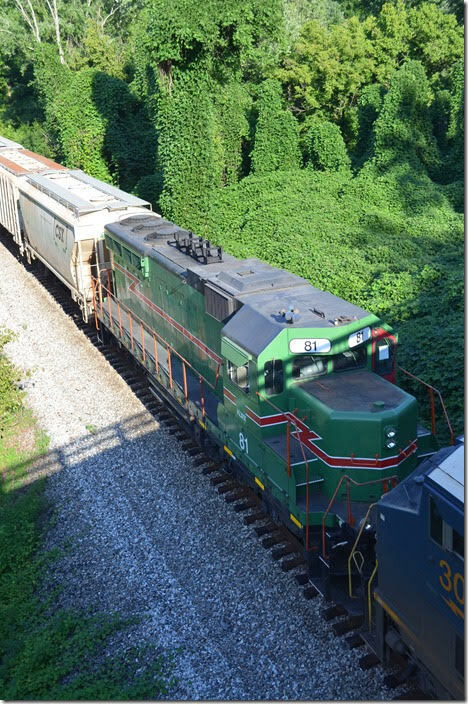 CSX 844-211 accelerate s/b N312-03 with 107 DKPX (Duke Energy) loads past the inactive load-out at Levisa Jct. 20. 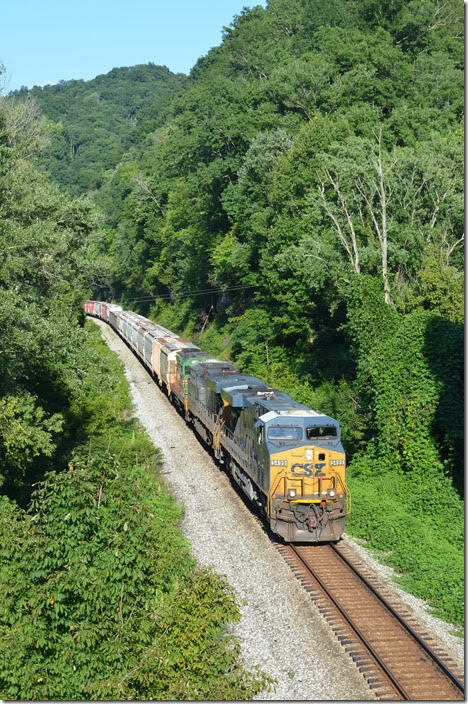 N312-03 grinds slowly up the steep grade across Pool Point trestle just south of Elkhorn City KY, on the Kingsport SD (former CRR). 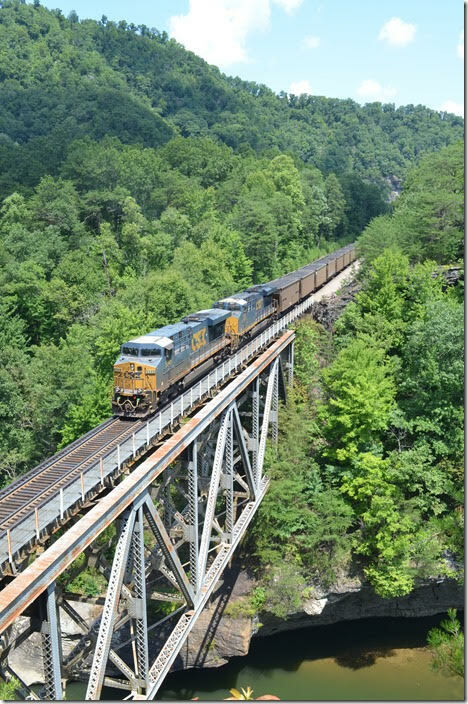 CSX 844-211. 21. DPUs shove hard. 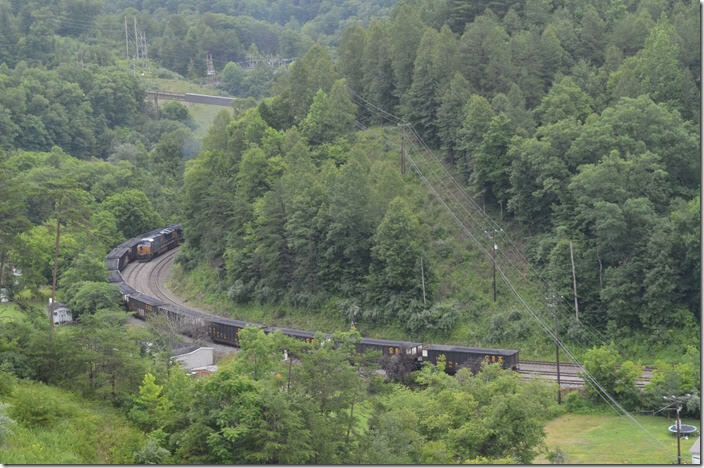 CSX 5345-993. Pool Point KY DPU. 22. 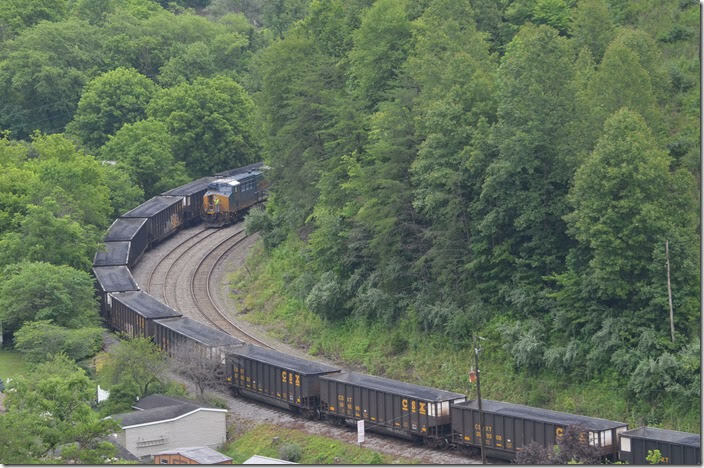 The two young couples have wisely paused their hiking until the coal train clears. 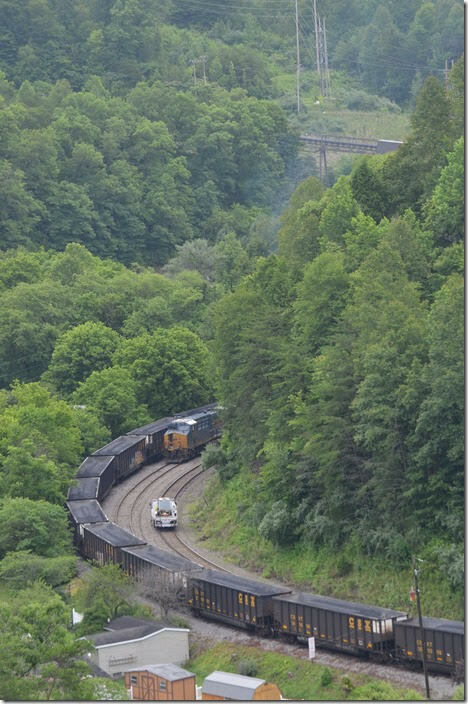 CSX 5345-993. View 2. Pool Point KY. DPU.